Washington - House and Senate lawmakers announced an agreement Tuesday on an aviation bill to boost airport security, reduce screening lines and require airlines to refund fees to passengers whose bags are lost or delayed. The bill would also extend the Federal Aviation Administration’s programs and policies through Sept. 30, 2017. The FAA’s current operating authority is set to expire July 15. The bipartisan agreement was announced by senior members of the House and Senate transportation committees. Approval by both chambers is expected to swiftly follow. Congress has only nine days to act in order to prevent a partial shutdown of the agency. The bill would require airlines to refund checked bag fees to passengers whose luggage is lost or is delayed 12 hours or more for domestic flights or 15 hours or more for overseas flights. It also requires airlines to provide families with information about the availability of seats together at the time of booking, and to generally ensure that children 13 years of age or under are seated adjacent to an adult or older child traveling with them. A bill that passed the Senate in April by a vote of 95 to 3 would also have extended other consumer protections to passengers, including a requirement that airlines refund fees for other services when not delivered, such as advance seat assignments or early boarding. But those provisions, which were opposed by airlines, were dumped during negotiations with the House. To address long airport screening lines, the bill requires the Transportation Security Administration to hire a marketing firm to generate greater public participation in the agency’s PreCheck expedited screening program for passengers who have been vetted and determined to be low security risks. The bill also requires TSA to ensure PreCheck screening lanes are open during high-volume travel times. And the measure authorizes a pilot program to develop and test more efficient passenger and luggage screening systems. 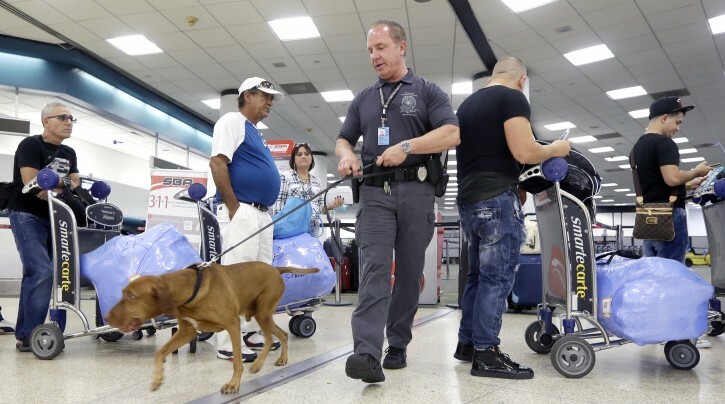 Responding to airport attacks in Brussels and Istanbul this year, the bill also authorizes a doubling of TSA teams that stop and search suspicious passengers in airport public areas that are outside the security perimeter, often using bomb-sniffing dogs. The bill would toughen the vetting of airport employees who have access to secure areas, expand random employee inspections and require reviews of perimeter security. That is a response in part to the “insider threat” problem raised by the destruction last year of a Russian Metrojet airliner over Egypt. Investigators suspect a bomb was smuggled aboard. Among several drone-related provisions, the bill establishes a process for the FAA to designate special areas where drones may not fly. Possible examples include around critical infrastructure, chemical facilities or amusement parks. The chemical industry lobbied for inclusion of the provision. The bill also prohibits drone users from interfering with emergency response activities like fighting wildfires and raises civil penalties to not more than $20,000 for those found in violation. Authorities across the U.S. recorded 20 incidents in which drones flew too close to wildfires last year, with more than half hindering firefighting efforts. It has happened again at least nine times so far this year. The bill is also notable for what it doesn’t include: any plan to remove air traffic control operations from the FAA and spin them off into a nonprofit corporation. The privatization plan was the top legislative priority of Rep. Bill Shuster, R-Pa., chairman of the House transportation committee, and the airline industry. In recent weeks, Shuster backed off his insistence that any FAA bill include the privatization plan in the face of opposition from other powerful committee chairmen opposed to ceding Congress’ authority over aviation matters to a corporation. Other segments of the aviation industry that feared a corporate board would be dominated by large airlines also opposed the plan. Airlines say privatization is needed because the FAA’s culture is too slow and inflexible to finish the air traffic system’s transition from old radar technology to satellites. The modernization has dragged on for more than a decade and fallen short of promised financial benefits and reduced congestion. GET RID OF THE TSA, IF WE WANT TO SOLVE AIRPORT PROBLEMS. BRING IN ISRAELI SECURITY EXPERTS. THE PRESENT SYSTEM IS SIMPLY NOT WORKING. That will never happen. The Israeli security relies heavily on profiling because it works. An Israeli expert once told me that there are many things already on the plane that can be used to do harm id used by the wrong person. The Israeli security want to keep that wrong person off the plane. Period!